Minerva's aims to retain a responsible ecological "footprint", as well to reduce allergens in the environment. We aim to make you feel as if our bed and breakfast services were designed just for YOU ! We call it "you-centered" hospitality. And part of that is working to protect the world for all of our children and grandchildren, by aiming for environmental responsibility. For more information about this initiative, please contact us today. The building is well-insulated, and your rooms have windows that open, so artificially-heated or cooled air can be used as little as possible. Our automatic thermostats further conserve heating/cooling energy, and frequent filter replacements both clean the air and make the HVAC work more efficiently. The soap, shampoo, and lotion in our guest rooms is made by Greenwich Bay Soaps, (www.gbsoaps) which produces gentle, natural, non-animal-tested products, and has a decades-long policy of environmental-awareness. Whenever we can, we source our produce from local suppliers; we use a fuel-efficient vehicle; and we “bundle” our errands. We try to choose products that produce minimal waste in packaging, and we bring home our purchases in re-usable bags. We compost some of our food waste, and we understand that by using our garbage disposal for the remainder, we allow the sanitation folks to turn it into fertilizer. We continue to use cloth napkins, and/or non-bleached paper products, and of course we recycle paper, plastic, and aluminum. We run the dishwasher only when it's full. We use energy-efficient light bulbs, low-flow showers, low-volume toilets, and Energy- Star appliances, including a front-loading clothes washer. We use 'free and clear' cleaning products. We use high-efficiency laundry detergent; offer our guests the option to re-use towels; and we purchase high-quality cotton linens, which release stains so they do not have to be discarded so frequently. But we DO choose to guard our guests’ health and safety by using HOT water to wash bedding and table linens. 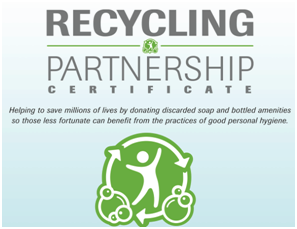 Minerva's is pleased to partner with Clean the World, a non-profit organization that sanitizes used soap from hotels, repackages it and distributes it to parts of the world where this help is critical.